I have several sketchbooks traveling the country (and Canada) this year through projects of the The Sketchbook Project (Art House Co-op) of Brooklyn, NY. If one comes to your town, I hope you’ll take the chance to seek it and its many friends on the road trips. 500 handwritten books from writers and illustrators around the globe. 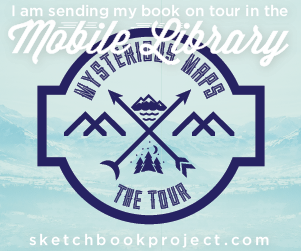 The Mystery Maps Tour asks you to make original maps of real and imagined places. 11,000 sketchbooks on the road starting March, 2013. Check ’em out! Brooklyn, Austin, Atlanta, Toronto, Chicago, Portland (OR), San Francisco, Chicago, and Los Angeles. This entry was posted on Sunday, March 17th, 2013 at 1:16 PM and is filed under drawing, writing. You can follow any responses to this entry through the RSS 2.0 feed. You can leave a response, or trackback from your own site. This is a post from my personal blog, but I’m sharing it on the “Librarian Hats” blog for my librarian friends who might want to see some fun work on parade!